Longyearbyen is by many means a special place. The little town with just over 2,500 inhabitants attracts many on a seasonal or short-term basis. These people are working in tourism, but also in the building industry or in small trade or for any company that needs labour force for shorter periods. Many companies are currently facing problems to find housing for their employees, such as the tourism industry which has a very busy time now as the important winter season is in full swing. Larger companies as well as institutions such as the university (UNIS)/Polar Institute, Sysselmannen and local administration have got considerable numbers of flats for their employees to be able to compete with employers on the mainland. Recent years have seen significant price increases for buying and renting, which has to a large degree to do with evacuations because of the avalanche danger. These evacuations have become a regular and long-lasting phenomenon now that is affecting whole streets. As in many other places in the world, there are those owners who have dollar signs blinking in their eyes. A number of flats are rented out through Airbnb, mostly to tourists on a short-term basis. This is certainly an attractive offer for the users and it includes flats which are used by companies for their employees when there is demand, and nothing is wrong about offering these flats on the market while they are not used. But there are also those flats which are now exclusively used for Airbnb and thus not available for the local housing market anymore, a situation that is met with growing criticism both locally and elsewhere. One of the larger owners in Longyearbyen, the mainland company Longyearbyen Boligeiendom, bought seven houses with a larger number of flats in 2012 for a price of 37 million NOK (about 4.8 million Euro back then). Rentals were soon increased by 45 %. Now, Longyearbyen Boligeiendom has announced to sell five of their seven houses with a total of 84 flats, aiming at a price of 77 million NOK. The company has said to have spent many millions on renovation, but this might well be (over)balanced by the income from rentals. Longyearbyen Boligeiendom might well leave the local market with a profit not far form 100 % of the original investment after six years. The two houses that are not (yet) for sale are in an area officially exposed to an avalanche risk, and a potential sale will not be considered before the slopes have not been secured technically. Currently, these houses would be hard to sell, if not impossible. 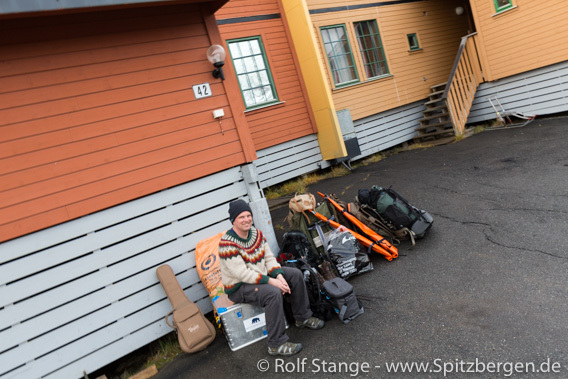 No place to stay in Longyearbyen these days? Tough luck, indeed! On top of all this came the news that the local administration keeps a number of flats vacant. This is obviously controversial at times of a stressed housing market. It is about 24 flats in way 222 which have been vacant for months now. Large investments were made actually just last year to brush these flats up. Representatives of the local adminstration said that it was decided against renting these flats out even on shorter contracts as long as final decisions have not been made regarding the avalanche situation and securing the dangerous slopes of Sukkertoppen, a process that has already been going on for years. In addition comes that further investments need to be made to renew the foundations of the buildings. Nevertheless, it is said that the flats could be rented out and used and it seems to be a political decision to do so or not. Leaving 24 flats vacant for months, possibly years, in times of a housing market under pressure is not necessarily a decision that is met with great sympathy, while some a desparately looking for housing for themselves or their employees.